Popping in to say happy birthday to my lovely lovely Lily and share her birthday card. I used one of THESE stickers, some Thickers, grid paper from THIS pad, and polka dot paper from THIS pack. 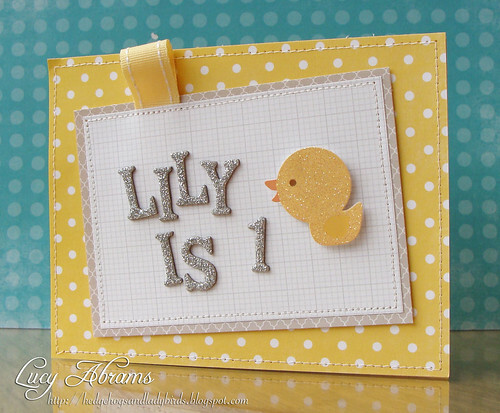 Love the yellow and the sparkly letters & little chickie. Happy birthday to your little girl!! So CUTE Lucy!! Happy Birthday to that Sweet Baby Girl....Hard to believe she is One!! I can't believe it's been a year! Cuddles and hugs to your sweet little one! happy birthday to your sweet girl! hope she has a great day! happy birthday lily! i can't believe that she's one! Oh my, that year went by fast! Happy Birthday, Lily!! such a cute card...happy birthday lily! Happy Birthday to Lily and you..hope you have all a great day! Awww a year already! Happy Birthday Lily! Happy Birthday sweet Lily! Wow! I can't believe she's a year old! Delightfully sweet card! Oh wow, where did that year go? Happy Birthday to Lily - love her card. What an adorable card! Happy Birthday Lily!! Happy birthday Lily. This year has simply flown by. Gorgeous card. such an adorable card, Lucy! Happy Birthday to Lily! How time flies so fast! Happy birthday to your little Lily! Very sweet card! Lily's first birthday card is adorable! I'm sure you look back, too, and wonder where the year went!! I'm so happy for you! Happy Birthday, Lily!